An easy think ahead meal! 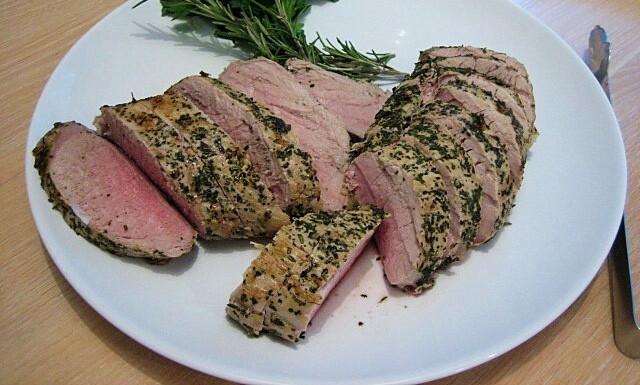 Earls pork tenderloin, well trimmed, approximately 12oz. Combine garlic, lemon zest, parsley, thyme, rosemary, oil, salt and chili pepper flakes in a small bowl. Generously rub mixture all over pork. Place pork in a resealable bag. Seal bag and refrigerate for up to 24 hours. Arrange pork on a foil-lined, rimmed baking sheet. Roast at 375ºF to an internal temperature of 155-160ºF, 20 to 25 minutes. Remove from oven; tent loosely with foil and let rest 5 minutes before slicing thickly. Serve the pork slightly pink on the inside, accompanied with rice or pasta and your favorite fresh vegetables or a salad with citrus fruits and pine nuts.